Security Analysis was published over 70 years ago. To this day, the teachings of Ben Graham and David Dodd hold truer than ever. Graham used to love buying his famous “net-net” stocks, companies that were selling for less than the value of their current assets minus all liabilities. As more entrants came into the markets, these types of opportunities all but vanished. Nonetheless, the enterprising investor applying some serious effort can still uncover some gravely mis-priced securities. Graham and Dodd’s core concept was to apply analytical effort in examining securities and purchase those selling below their intrinsic worth. The behavior of market participants over the long-term is quite predictable and if you follow the above advice from Buffett, you will do better than most investors. Buffett holds one of the best long term investment records ever, compounding money at over 20% for 40 years. Buffett made his money by exploiting market opportunities where there is a high degree of fear or pessimism. Bear present the most common market environment in which to locate temporarily mis-priced securities. In 1974, after a bull market spanning nearly two decades, the markets fell hard. Overcome by fear most people missed out on one of the century’s best buying opportunities. 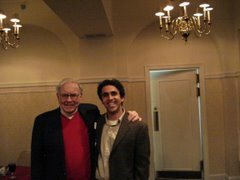 It was around this time that Buffett began scooping up shares in the Washington Post and Buffett's $10 million investment back then is worth over a billion today. Again in 2003, securities again were cheap, but everyone was afraid even though gap between value and price was wider than it had been in a decade. Investors who are overcome by emotion always disregard market fundamentals leading to the purchase of securities when one should be selling and vice versa. October 20, 1987 would later represent one the best buying opportunities for stock investors. Investing is "simple but not easy." The idea is simple: simply buy when Mr. Market is acting irrational, but not easy in that most people do the opposite of what they are supposed to be doing: buying on the way up and selling on the way down. Mohnish Pabrai hosted his second leg of his annual meeting on September 27 in Chicago. Each year, Pabrai holds two meetings - one in Chicago and the other in Huntington Beach, CA to accommodate the geographic disbursement of his investor base. 1. Since the 1999, the annualized return has been over 29% after fees. According to data from Lipper, this performance ranks the Pabrai Investment Funds number 3 out of some 4,000 mutual funds during this eight year stretch. Buffett used to compare his investing to a baseball player at bat. Unlike baseball, in investing, you have no called strikes. You can wait and wait until the fat pitch comes to hit one out of the park. Most market participants mistakenly assume that they will be penalized if they don't pull trigger and buy something (who wants to be sitting still when the Dow is up 400 points in a day?). There is no way that you will lose any money if you just sit still and do nothing. Wait for Mr. Market to serve you instead of guide you. 1. The "price is what you pay/value is what get" concept. As Ben Graham alluded, every stock is a good investment at one price. One has to be patient and disciplined not to overpay. A good company (Google) is not necessarily a good investment ($500+ per share, over 40x P/E, etc.). 2. Be willing to watch your investment decline by 50% and sit still....or buy more. Buffett once remarked that you should be able to see your investment decline by half and have the conviction to buy more if your analysis and reasoning are right. (Remember that I am implying that nothing has occurred to change the intrinsic value - and that you would have caught such a deterioration way before such a drop). Several years ago, Pabrai experienced a multi month time period during which the net asset values of his fund were down by more than 30%. Stocks he had bought were down by 40, 50 or more percent. According to Mohnish, this was not a hypothetical situation. There were some investors who literally entered his Fund right before the decline and they received statements indicating that their investments were down by over 30%. There was no specific reason for the decline. The businesses were still intact. There was no direct correlation in the fund's holdings. There was no particular sector or industry weighting on the portfolio. Each company operated in a different industry, with a different set of economic considerations. What had happened was that the Dow Jones average had dropped from around 10,000 to 7,000. Sometime during this situation, many investors would have gotten out at a decline of 10-15% giving no second thought to the fundamental soundness of the individual businesses. Once the paper loss is realized, the investor is focused on recouping the loss quickly, an process that often ultimately leads to a less prudent investment approach. Pabrai discussed the individual investments during that time, his cost, where they stood during the market decline, and ultimately where they stood when he exited. In the end, the stocks recovered, some doubling and tripling the investment return. "I consider myself a gentleman of leisure. I go into the office with no set goal of buying or selling. I just wait for something to grab my attention." And that's all that needs to be said. The results speak for themselves. The rest of the meeting Mohnish spent answering questions and as usual, there was no discussion on any current or potential investments.